Closing after 25 years on the 'Fax. 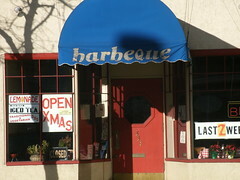 Our good friend and neighbor Wolfe’s Barbeque is closing after 25 years in business. Owner Louis Wolfe has been serving up delicious and affordable BBQ for more than a quarter century. He has decided that now is the time to “reinvent” himself and close his wonderful restaurant after Christmas, the day when Wolfe opens up annually to serve his affordable BBQ to the masses when many other places are closed. We wish Mr. Wolfe the best on his new life journey and will of course miss his cheerful presence on our block. Please do yourself a favor and visit his establishment one last time if you can. You’ll be experiencing Mr. Wolfe’s passion and dedication to delicious BBQ that has kept hearts and stomachs full through five presidential administrations. This entry was posted in Uncategorized and tagged Friends, Neighbors, Wolfe's Barbeque. Bookmark the permalink.